Today is All Souls’ Day in the Catholic liturgical calendar, and the Day of the Dead in Mexico (which I think is actually two days; this is the second one). I never knew that much about either holiday, but I mentally linked them with Halloween, which isn’t entirely accurate. There’s a lot of appropriation of the latter in the United States these days, with people wearing colorful skull makeup without having any idea of the origins. I believe I saw a decoration at a Halloween store last month that had the skulls accompanied by “Happy Halloween,” even though it’s not exactly the same. Most cultures had some sort of culture to honor the dead, sometimes linked with the idea that the boundary between the worlds of the dead and the living weakens around that time. The Celtic Samhain was one such festival, and that’s generally considered to be the precursor to the modern Halloween. 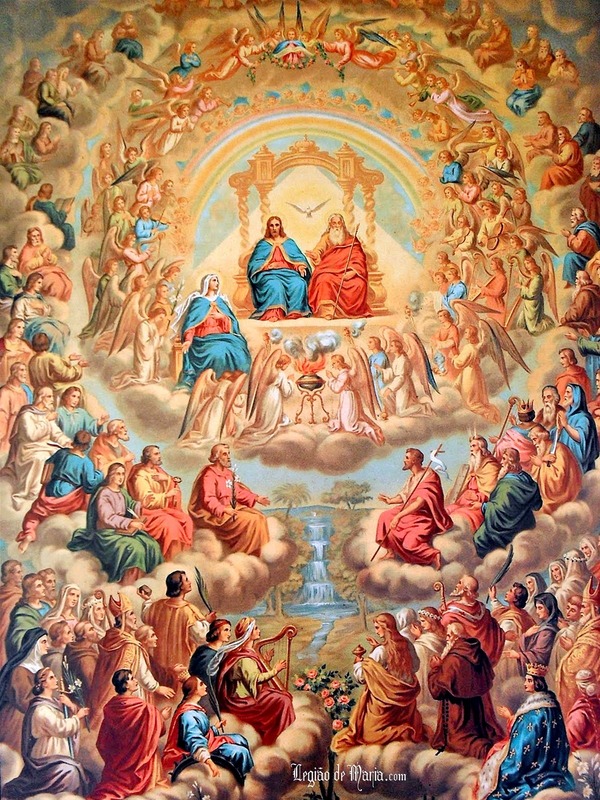 The Catholic Church came to celebrate All Saints’ Day, honoring the saints in Heaven who didn’t have their own days; and followed that with All Souls’ Day, honoring the dead who were still in Purgatory. These didn’t really catch on among Protestants, as saints and Purgatory really didn’t have much place in Protestant belief; but some traditions associated with the holidays continued among non-Catholics. The thing is, earlier celebrations of All Saints’ Day took place in the middle of May, around the same time as the Roman Lemuralia, when beans were offered to the restless dead. The Eastern Orthodox Church still celebrates the holiday the Sunday after Pentecost, in late May or early June. It appears to have been moved to the beginning of November in the eighth century, perhaps to coincide with and replace Samhain or another similar festival. Dia de Muertos (apparently the addition of “los” is a more recent formation) probably derives from ancient Aztec traditions devoted to Mictecacihuatl, the goddess who ruled the world of the dead. They took place in the summer, the present date being due to the influence of Spanish Catholic conquerors, who presumably associated it with their own All Souls’ Day. So it’s not a coincidence that all of these holidays honoring the dead take place around the same time, but it didn’t start out that way. Sugar and clay skulls, or calaveras, as decorations date back to the seventeenth century, but much of the imagery commonly associated with them is rather more modern. 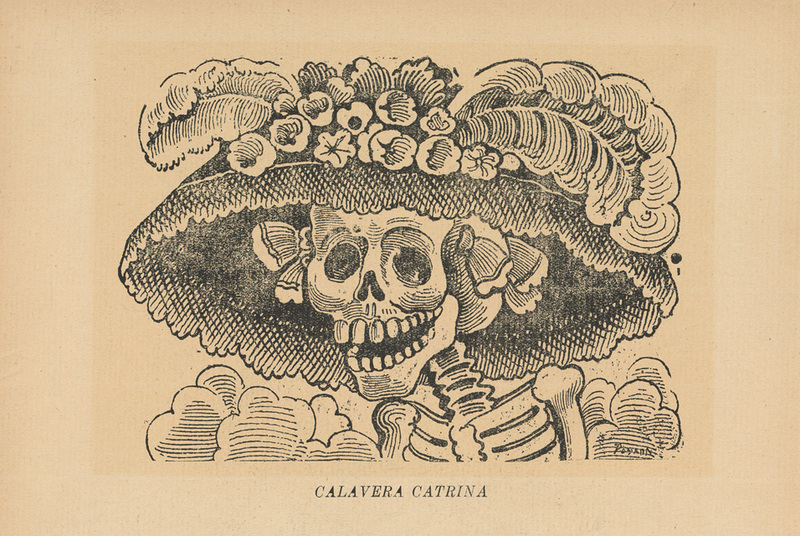 In the early twentieth century, the printmaker Jose Guadalupe Posado engraved pictures of skeletons dressed in fancy European-style clothing to mock members of the upper classes who ignored their own heritage. From what I’ve read, she’s become the face of Dia de Muertos, making her basically a more comical Mictecacihuatl. She symbolizes both a mockery of death itself, and how death takes even the rich. (Personally, I feel that this idea, while technically true, has become largely moot considering how many more life-extending treatments are available to people with more money.) The face-painting associated with the holiday usually references Catrina, as well as being a tribute to loved ones. So white people nowadays are appropriating a Mexican symbol used to mock the imitation of white European culture by rich Mexicans. Trying to reason that one out is a sure route to a pain in the calavera. 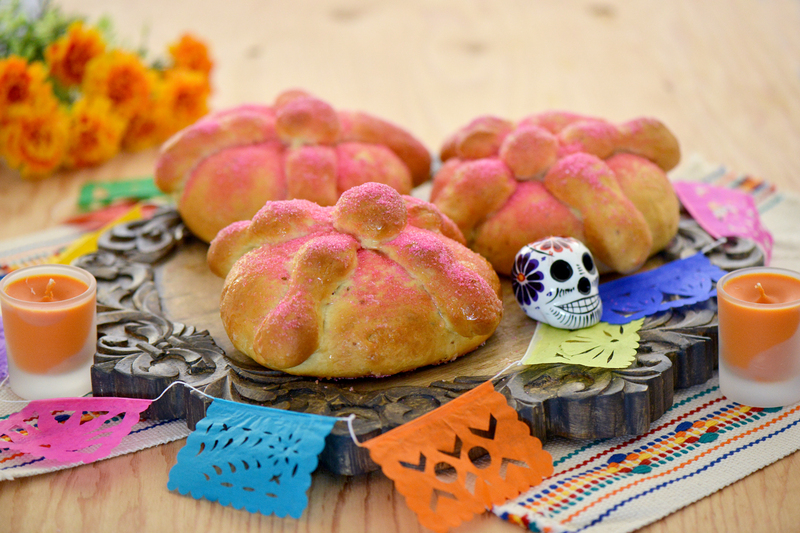 The sweet bread known as pan de muerto, which is associated with the Day of the Dead, is said on some websites to contain a reference to another Aztec goddess, Chimalma, a fertility deity said to be the mother of Quetzalcoatl. 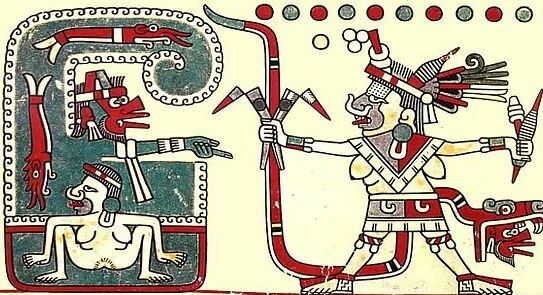 There are a few different accounts of how this happened, but one is that she managed to catch several arrows shot by Mixcoatl, the god of the hunt, with her bare hand, which is why her name means “shield hand.” Quetzalcoatl, or at least an avatar of his, was conceived when Chimalma swallowed a piece of jade. The baked teardrops on the bread supposedly represent her tears for the living, but none of the sites that mention this give any source for the information. It’s an interesting idea, but seems a bit far-fetched considering that I’ve seen no indication of Chimalma being attached to the holiday in any other way. I don’t know that there’s any direct link between pan de muerto and European soul cakes, but the latter are associated with All Souls’ Day. 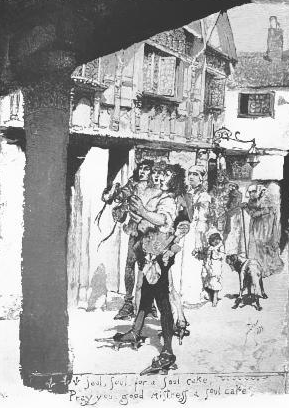 Starting in the Middle Ages, people would go from door to door offering prayers for the departed. In exchange, people would give them these cakes. It’s similar to trick-or-treating, although nowadays parents would probably throw out soul cakes because they weren’t factory-wrapped. 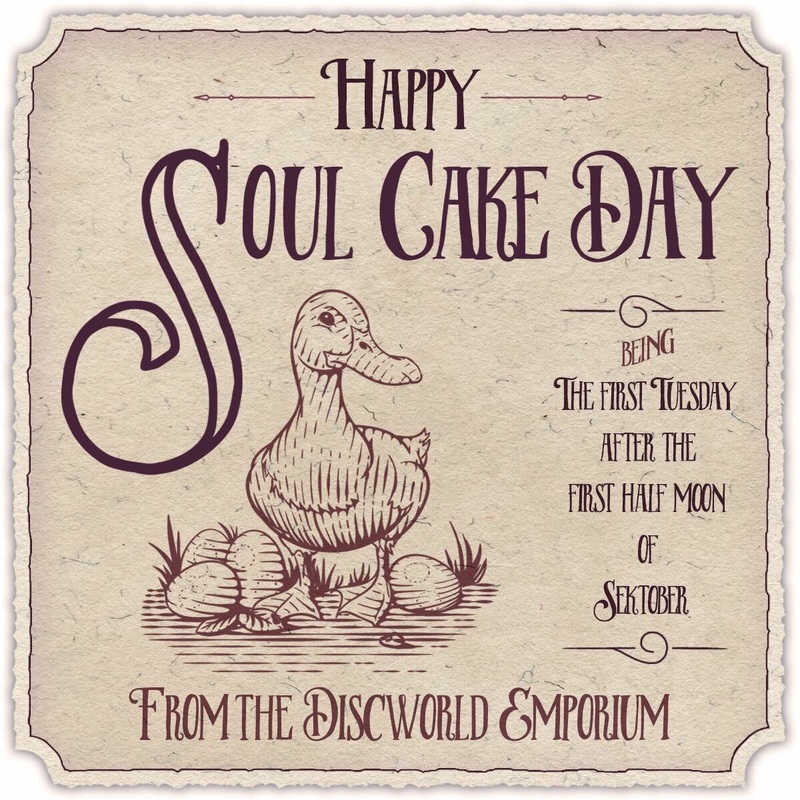 I was interested to learn that soul cakes were a real thing after seeing references to Soul Cake Tuesday in Terry Pratchett’s Discworld series. This holiday is sort of a combination of Halloween and Easter, as it involves egg rolling and is represented by an animal, the Soul Cake Duck. This entry was posted in Authors, Aztec, Catholicism, Celtic, Christianity, Discworld, Eastern Orthodox, Halloween, History, Holidays, Mesoamerica, Middle Ages, Mythology, Native American, Religion, Roman, Terry Pratchett and tagged all saints day, all souls day, calevara, chimalma, day of the dead, dia de muertos, diego rivera, jose guadalupe posado, la calavera catrina, lemuralia, mictecacihuatl, mixcoatl, pan de muerto, purgatory, quetzalcoatl, samhain, skeletons, skulls, soul cake duck, soul cake tuesday, soul cakes, souling, sugar skulls, trick or treat. Bookmark the permalink.